When Truth Magazine began in the fall of 1956, the sponsoring church issue had been brewing since shortly after the end of World War II. As American servicemen came home from Europe and the Pacific with images of the horrors of war stamped in their minds, a new wave of evangelistic fervor surged through the hearts of many brethren. This admirable zeal was tainted by a failure to keep in focus what the New Testament taught about the work and organization of the church. That the local church was obligated to preach the gospel at home and abroad to the limit of its ability was not in doubt. But the limitations upon the oversight of local church elders was not so clearly perceived. This zeal without knowledge gave rise to the sponsoring church. Just What Is a Sponsoring Church? A sponsoring church is one that assumes a program of work, accepts responsibility for funding it and then solicits other congregations to pro-vide the money. The elders of that sponsoring church agree to oversee the work, guarantee the expense, provide what funding they are able and then rely on other congregations to send them the funds to accomplish the work. In this arrangement, a local church eldership assumes a work which it alone is not able to do, a work to which all congregations sustain the same relationship. In the early part of this century, the church at Henderson, Tennessee began such a work. Under the elders there, evangelists were to be sent out into western Tennessee and Kentucky, northern Mississippi, northeastern Arkansas, and southeastern Missouri. The Henderson elders offered them-selves to choose the men, send them out and see to the work, and asked other congregations to provide the funding. David Lipscomb was still editor of the Gospel Advocate and opened fire on the plan with heavy artillery. He saw it as a died-in-the-wool missionary society which was made no better for being under the elders of the Henderson church. Under such fire, the plan withered and died. After World War II, the sponsoring church was reborn. The Union Avenue church in Memphis, Tennessee decided to become a sponsoring church for the work in Japan. The church in Brownsville, Texas sponsored the work in Italy and the Broadway church in Lubbock, Texas became sponsor for the work in Germany. After the first wave of excitement and enthusiasm had faded somewhat, opposition was raised to such plans. Articles began to appear in the Gospel Guardian and this opened a loud controversy taken up by the Gospel Advocate. Numerous articles began to appear on the subject of church cooperation. Those opposed to the sponsoring church arrangement were soon dubbed "anti-cooperation." The Preceptor which began in 1951, also took aim on this subject and opposed the sponsoring church. It became commonplace for men who wanted to go overseas to preach, to find a sponsoring church. That practice persists to the present hour. The signature sponsoring church effort began in 1951 when two young preachers, James Walter Nichols and James D. Willeford, brought a plan which they had used on a more limited scale in the Midwest, to the elders of the Fifth and Highland church in Abilene, Texas. It was a plan for a nationwide network radio program. The elders agreed to accept the sponsorship of this program. I heard the first broadcast in the home of one of the elders of the West End church in Atlanta, Georgia. As the program expanded to television and monetary demands became greater, the solicitations became more fervent. Soon one of the elders devoted full time to traveling the country seeking funding for the work. Area representatives were chosen over the nation. 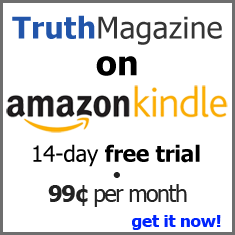 When Truth Magazine began, it was nearly a year be-fore direct reference was made to a sponsoring church and even longer before Herald of Truth was singled out. Early issues of the paper carried articles on a variety of subjects, many of them aimed at modernism which was a real threat in the Chicago area where the paper was born. But there were early articles on Bible authority and on controversy and attitudes which ought to prevail in the wake of it. In December 1956 there was a reprint of an article on "Church Cooperation" by H. Leo Boles which appeared in the Gospel Advocate in 1932. Ray Ferris followed with an article in February 1957 on "What Is Autonomy?" In March 1957, Bryan Vinson, Jr. had an editorial on "Our Level of Discussion" in which he mentioned that Herald of Truth (and some other subjects) were being defended on an emotional level rather than a studied scriptural investigation. In 1958 various articles appeared which mentioned the sponsoring church along with church supported benevolent institutions. In April 1959, Morris W.R. Bailey of Canada, wrote on "When Is a Practice Unscriptural?" In it he dealt with the sponsoring church and the Herald of Truth in particular. In October 1959, Harry Pickup, Jr. wrote on "The Oversight of Elders." In 1959-60 Cecil Willis wrote a series on "All-Sufficiency" which dealt with this subject. During these years there were reports of several debates among brethren on this subject. These included both of the Cogdill-Woods debates (Birmingham, Alabama and Newbern, Tennessee), the Flannery-Inman debate in Columbus, Ohio, and the Grider-Woods debate in Louisville, Kentucky. Perhaps the best article of all to that time, was the one by Bryan Vinson, Sr. in November 1961 ("Some Basic Facts Considered") in which he cited arguments made against the sponsoring church by Foy E. Wallace, Jr. Among them, Wallace had argued that the sponsoring church violated the scriptural limitations placed on elders in 1 Peter 5:2 where they are charged to oversee "the flock among you." He charged that the sponsoring church created an inequality among churches, sort of a system of religious feudalism. He said it made brotherhood elders of these men and argued that was a step in the direction of Rome. He further argued that this practice created an interdependence of churches without scriptural warrant. In June 1963, editor Cecil Willis unleased heavy bombardment on the practice with an article on "Brotherhood Elders." In 1966 Cecil Willis debated Clifton Inman at Parkersburg, West Virginia and thoroughly exploded the argument usually made for the Herald of Truth that it was an "expedient" way to preach the gospel. Willis showed not only that the practice violated scriptural teaching on the work and oversight of elders, but he produced several charts showing from financial reports from the Highland church that it was costing huge sums of money just to "grease the machinery." He showed how many gospel preachers could be supported at current levels by the funds used to solicit more support. He further questioned the expediency of any-thing which had produced so much tension and division among brethren. There can be no doubt that the material published in the paper had a telling effect in helping to salvage scores of congregations and hundreds of brethren, particularly in the Ohio Valley and Upper Midwest who otherwise would have followed the multitude to do evil. The influence of Cecil Willis, Earl Robertson, William Wallace, James P. Needham, and the earlier work of Bryan Vinson, Jr. and Sr., Leslie Diestelkamp, Gordon Pennock, Ray Ferris, and others, made a great difference. There are many faithful churches now in these areas where men are laboring today due to the hard work and unrelenting teaching of these good men and those who assisted them. When the history of the work is written, if it is accurately done, the effect this paper and its writers had on the study and thinking of brethren during these turbulent years will be profound. The abuse they suffered in the process was beyond imagination for those who did not experience it.